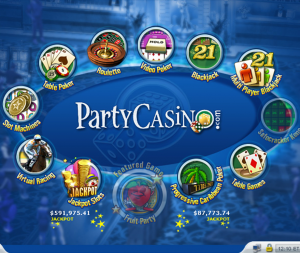 Party Casino is a part of worlds largest online gambling company, known as bwin.party entertainment. 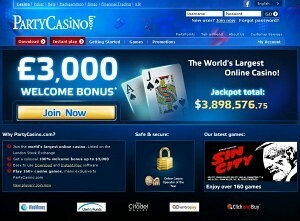 The company was created in a merger of two big gambling companies. If you end up choosing this casino, you’ll be able to choose from hundreds of online slot games that are unique and can be played only at Party Casino. Top it off with constant and rewarding promotions as well as an industry leading VIP Club for the most loyal players. Do we have a jackpot? The software in question, the one that empowers all the casino games found at Party Casino, is unique and developed by their sister company. You can choose between an instant play version, suiting those using Mac and Linux powered computers or download the casino client and play all the games using that one. Regardless of which one you end up choosing, the gaming experience will remain the same. Party also supports mobile gaming and in case you own a iOS or Android powered device, you’ll be able to play all the games. Choose from more than 200 unique casino games including slots, blackjack, roulette, baccarat and much more. Listing all of the games would take up several pages, but let’s go through the most popular ones that stand out from the crowd. With more than a hundred slot games on the offer, you’ll surely find something that fits your desires. We’ve came up with a top 5 slot machines to Play on Party Casino. Don’t be too sad if any of these doesn’t fit your desires, as there are plenty more of them! Amazon Wild – 100 pay line slot game themed after the wild jungle near the river of Amazon. Features a bonus game as well as scatter and wild symbols. The latter substitutes for any other symbol except the scatter. California Gold – twenty pay line machine with a free games feature and a bonus game. It’s themed after the golden era in America. Duck Hunt – five reel, 60 pay line slot machine offering a Duck Hunt free spins feature which can be triggered by spinning at least 3 scatter symbols. Beat The Bank – an entertaining slot game that is created after the concept of robbing a bank. Bonus game visualizes blowing up a safe, including animations. Play on up to 20 pay lines and break the bank yourself! Cleopatra – a 20 pay line slot machine with a free spins feature that is awarded for spinning at least 3 scatter symbols. The diversified range of games at Party Casino is really impressive. On top of the slot games offered, you’ll be able to play blackjack, roulette and other table games. Let’s take a look at the amount of variations offered for the first two. BlackJack – multi-hand, bonus pairs, high limit, multi hand PRO, single deck. 100% bonus up to $/£ 3,000 – great for slots players. Use a bonus code 750SLOTS and you’ll receive a 100% up to $/£ 750 on your first four deposits. 50% bonus up to $/£200 – great for players of all casino games. Use a bonus code 200ALLGAMES to claim this bonus. 100% up to $/£500 – tailored bonus for roulette players. Use bonus funds to play any of the roulette types offered at Party Casino. Use a bonus code 500ROULETTE to claim this bonus. As usual, these bonuses feature wagering requirement – terms that have to be fulfilled before you will be able to cash them out. For the slots bonus, you’ll have to wager 20 times the deposit + bonus amount in 30 days, before a withdrawal request will be processed. All casino games bonus features a requirement of 200 times the deposit + bonus, which is quite insane, so you should avoid this bonus. Roulette bonus features a requirement of 50 times the deposit + bonus, which is a great value given the house edge in this game. FAQ Section – before you actually contact someone, it’s worth giving this section a shot. Especially if your question is of basic nature. 24/7 email – contact payment or general support by writing an email. Phone – several country tailored phone numbers, some with an agent speaking in your native language.